I can load 20 page book in under an hour! Why did I wait so long!!!!!! I pondered this purchase for several weeks and finally decided to make the purchase. What a wonderful addition to my craft tools..it works so easy and when the glue dries my cards do not come apart as they have when using discount store adhesives. Should have gotten it months ago and started saving money on glue products but so it goes...but I know now I will never be without one of these applicators in the future. If you paper craft (scrapbookers & card makers) - You HAVE to have one of these! Easy to use, acid free adhesive, lasts forever, ultra sticky bond! You'll wonder how you survived without one. Be sure to buy the TAPE! In case it is unclear to anyone else who knows nothing about these, the $45.99 price (which is the best price I've seen yet on this item) does NOT include any 1/4" tape. Be sure to toss one in your cart! Can't use mine yet, but I KNOW it will be every bit worth a 5-star rating! My friends and I scrapbook alot and this is the best adhesive applicator we have had. It goes on so smooth. We had alittle trouble at first by reversing the direction and the adhesive went around the roller but it came off easily and we learned quickly not to do that. The size was alittle intimidating at first but don't let it scare you. It is easy to handle and comfortable to use. We found the refills on line for a fraction of what the smaller applicator refills sell for. We took them to an all day scrap and everyone wanted to try it out and then wanted to know how to get one. I highly recommend it. I am a "tool girl" and I LOVE this applicator. It makes adhering my photos and mats to my pages so quick and easy! It's a little bulky to work with, but worth the adjustment because the tape (roll of 36 yds) is much cheaper than the tape runners out there). The applicator itself is an investment but it won't take long for it to pay for itself. A must for anyone who does much scrapbooking. I love this tape gun. I use it for scrapbooking as well as wrapping presents.I would recommend this to everyone. The only thing is the description on here unless I read it wrong shows you can use 1/2 " tape. You cannot. You can only use 1/4". This is another GREAT product. Once you try it, you'll never go back to those little tape dispensers. It also saves you $$$. I use the 1/4" tape. The refills contain 36 yards of tape and I pay $3.44 for the roll. Big savings over the little containers. I have tried so many different products for scrapbooking, but this is the best . My sister recommended it to me and I have not put it down. So easy to use! A little tricky to load, but if I can do it, anyone can. Follow the directions. Now I use it for all kinds of crafting projects. You will LOVE it!! I have had this gun for about three years and it is by far the best tool I've purchased. (and I own a LOT of tools!) It has never gummed up or got jammed. It is a little tricky the first couple of times you need to load or reload it- so keep the instructions until you get used to it. The price here is amazing- I paid $$$ for mine three years ago, and I still feel it was worth every penny! I do a lot of scrapbooking and am loving this. It probably saves me $10 to $15 dollars a month on adhesive! Product exactly what I required and performs to my needs. I'm just sorry that at the time I purchased the applicator it didn't come with the option to purchase tapes as well. I can't wait to use this for more than scrapbooking, which was why I originally purchased it. I'm going to try wrapping Christmas presents and will see how it works. I am really enjoying my ATG 714. The adjesive lasts a long time. Definately a good product and investment. Never going back to regular tape runners! I LOVE IT! The next best thing to my cricut. Its going to last me forever. It is pretty hard to load the first time, but once you get it then its a breeze. So happy I bought this! There are places cheaper but when you go to the shipping part of it then its an arm and leg, so this one came out so much better for the price. This gun is fantastic to have around when there is lots of things to be taped. It is perfect for crafting, wrapping presents and quick fix items. The only thing that I do not like is that if you use it too fast, the tape will rip and will sometimes come off track. I use it all the time! Love it! this is one of the best atg guns around. I use it all of the time for cardmaking. It is a bit big, but you get used to it quickly. And, it's nice because you don't run out of tape in the middle of a big project. I own this ATG and have worked it to death. It is a workhorse. And I buy most all my papercrafting supplies from Overstock. 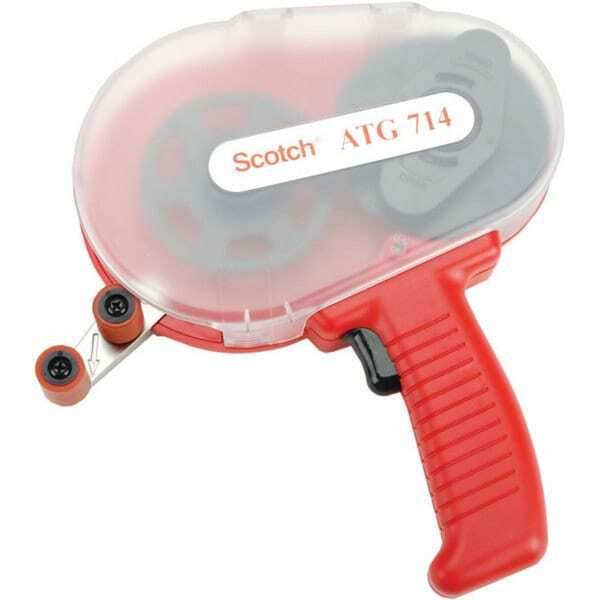 It took me a while to decide to purchase the ATG 714 because I felt that my hand held tape dispensers were okay. To my surprise, one use of the ATG and I am putting most of my hand held tapes away for a future craft sale. I know I need a few hand held, but I am a converted ATG user now. Since I buy the Gold tape when on sale, I am saving money although the initial layout was much higher than the through away hand helds. This thing turned out to be more work for me than it was worth. I don't even use it anymore because the tape kept twisting or sticking to itself. I kept having to open up the tool and release the tape and no sooner than I thought it was going to work properly, it would twist or stick again. I have had this for about a year and love it. I decorate for a lot of fundraiser events. This is always in my volunteer "tool kit" Much faster than a roll of tape and more economical. I had been recommended to purchase this item from several friends. I've had it several years now and it is just awesome. I'm not running out of adhesive and having to throw away a ton of plastic casings or changing the refills in the smaller hand held adhesive runners. I save tons of money too on the adhesive its cheaper to buy a 36yd. roll of excellent adhesive than 3 refills. It is a bit bulky and awkward at first but you get use to it quickly. I was learning to be a lefty after being a right after several years and It was still easy to use. When you do get towards the end of the roll no matter what brand of adhesive you purchase it does get tight and a lil tougher to roll but still not difficult. This is a real money saver! Was so anxiious to get this but it took longer to recieve than other items I have bought in the past from Overstock.com. It came packaged well. Wasn't sure at first if it came with an initial roll of adhesive, which it didn't. Thought the directions for loading the adhesive was hard to understand but the pictures saved the day. I wish I had purchased this sooner and would highly recommend it if you do much crafting of cards or scrap booking..
"will this gun hold 1/2" tapes"
Hello ciaobella66, this adhesive applicator is for use with 1/4-inch Scotch ATG tapes. Thanks for shopping with us! L.B. I just looked at my ATG and it has 1/4" tape and I have used it to death. But it appears to me that it maybe could hold 1/2" tape...unless the holder inside the gun would prohibit it. I have never had a problem with the 1/4" tape however and I glue everything with it.